Yes, there’s a line in the original version of “Who Loves You Baby” cloth book that says “Who takes you to the toilet day or night”. This refers to infant toileting, also known as elimination communication. It’s something we do at home part-time. I hold baby on the toilet when he wakes in the morning and at a few other times during the day. I do this mainly to avoid poopy nappies, to put the poop straight into the toilet where it belongs. 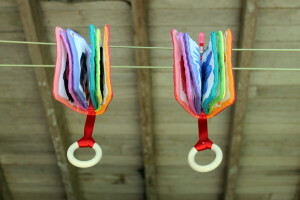 We still use nappies, cloth and disposables, because they are very convenient. But we also use the toilet. This is nothing new. The millions of mothers in the world, past and present, who have no access to disposable or cloth nappies/diapers, what do they do? They help their baby to do their business in the appropriate place.